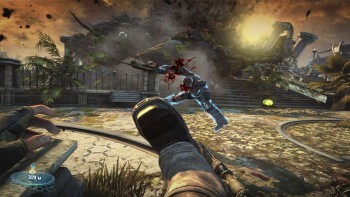 Epic: Bulletstorm "Didn't Make Money For Us"
Bulletstorm was a flop but Epic President Mike Capps maintains that he has no regrets about making the game and high hopes for the follow-up. Bulletstorm, the foul-mouthed FPS from Painkiller studio People Can Fly that came out earlier this year, was critically well-received (4/5 at The Escapist!) and went over well with shooter fans who played it. But as we've seen time and time again, a good game does not necessarily mean good sales and it would appear that the number of gamers who actually played it is relatively tiny. Bulletstorm failed to break 300,000 unit sales in its first month of release, according to analyst Doug Creutz, while a rep from publisher Electronic Arts said the game "underperformed." Now Capps has effectively confirmed those statements, telling Kotaku that the game "didn't make money for us," but at the same time he says he has no regrets about doing it. Capps didn't talk about why it didn't sell, instead focusing on Epic's all-in commitment to whatever it does, be it the Gears of War series or Infinity Blade for the iPhone. Epic could have pulled the plug on Bulletstorm and put People Can Fly to work on "churning out Gears of War content," Capps said, but that's not what Epic has PCF around for. Capps is giving a talk at the upcoming Game Developers Conference Europe entitled "Size Doesn't Matter: How Epic Brings AAA Attitude to Every Game, from Gears of War 3 to Infinity Blade," which may delve a little deeper into Bulletstorm's failure. Whatever the reasons, I hope it doesn't mean the end of "dicktits" in future marketing materials. GDC Europe runs from August 15-17 in Cologne, Germany.